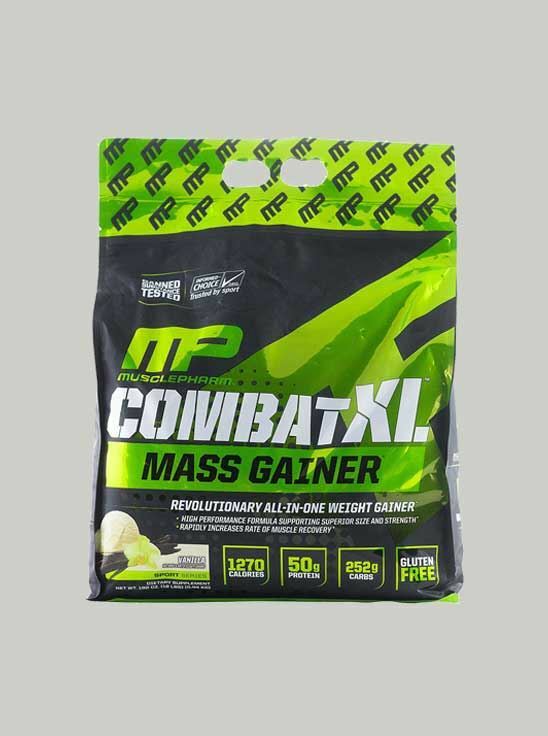 MusclePharm Combat XL Mass Gainer 6 lb Vanilla is a revolutionary mass gainer supplement that is formulated with high calories and essential nutrients that aid every fitness enthusiast to gain mass easily and effectively. It features essential fatty acids, carbohydrates, a different source of protein. 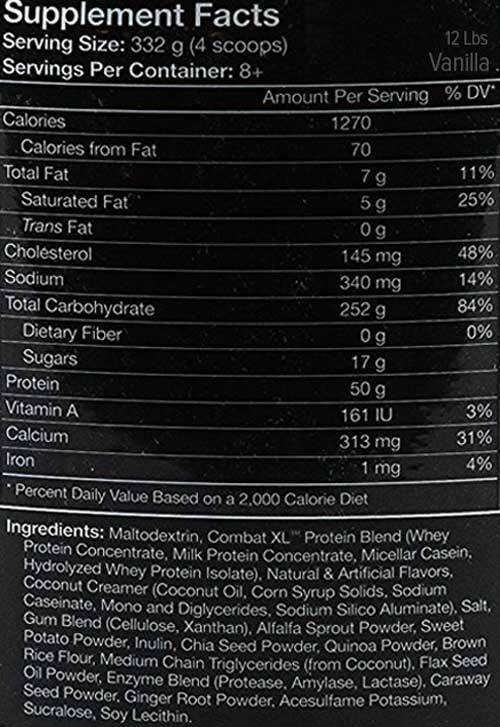 With all the essential elements, MusclePharm Combat XL Mass Gainer Vanilla aids to promote muscle recovery post strenuous workout sessions and is a gluten free dietary supplement. It comes loaded with the benefits of 50 grams of muscle building protein that aids to fuel your intense workouts and aids in rapid muscle recovery. This enhanced mass gain formula helps to deliver you with 1270 calories. It provides help to fulfil your daily protein requirement and delivers a massive 252 grams of carbohydrates so that you gain muscle mass quickly. Maltodextrin, Combat XL Protein Blend (whey protein concentrate, milk protein concentrate, micellar casein, hydrolyzed whey protein isolate), cocoa powder, natural & artificial flavours, coconut creamer (coconut oil, corn syrup solids, sodium, mono and diglycerides, sodium silico aluminate), salt, gum blend (cellulose, xanthan), alfalfa sprout powder, sweet potato powder, inulin, chia seed powder, quinoa powder, brown rice flour, medium chain triglycerides (from coconut), flax seed oil powder, enzyme blend (protease amylase, lactase), caraway fruit powder, ginger root powder, acesulfame potassium, sucralose, soy lecithin. As a dietary supplement for supporting muscle growth and recovery, mix one serving (4 scoops) of MusclePharm Combat XL Mass Gainer 6 lb Vanilla with 18-20 fl. oz. of cold water. Consume 1 to 3 times a day. Vary the amount of water to achieve your desired consistency and taste. To increase your protein intake per serving and achieve a delicious milkshake taste, use milk instead of water.